Workers at Guitar Center, the music gear company recently purchased by Bain Capital, say they can’t survive under new pay structures. At the end of May, employees at Guitar Center’s flagship store in Manhattan overwhelmingly voted to form a union of its fifty-seven retail workers. The national Retail, Wholesale and Department Store Union (RWDSU) organized the win, marking what the union hoped would be the first of many such votes around New York City and the rest of the country. Brendon Clark, 28, was one of the workers who voted to unionize. Clark has been working at Guitar Center for four years. Clark was hired about a year after Bain Capital bought Guitar Center in 2007, and he says a regular sales person at the store used to have a lot of autonomy, but things started to go awry when Internet sales for guitars and other equipment boosted and workers suddenly had to compete with giant online retailers like Amazon.com. Guitar Center tailored its marketing and discounting to represent the way the market was turning, and workers like Clark say their hourly wage and commission structure have been slashed since the investment firm took over. “What they started to do was offer sale prices all the time, price-matching Amazon, and basically doing whatever they can to make sure the customer leaves satisfied at the lowest price possible, but with the company doing that, in order for that demand to be met, they have to cut away at pricing, which cuts away at profit, which ultimately cuts away at our pay check because we’re 100 percent commission employees,” he says. “We’re paid on a pay structure that existed before the Internet existed. The company has modified their strategy in marketing and their web presence, and just about every way they do business, except for how they pay their employees,” said Clark. 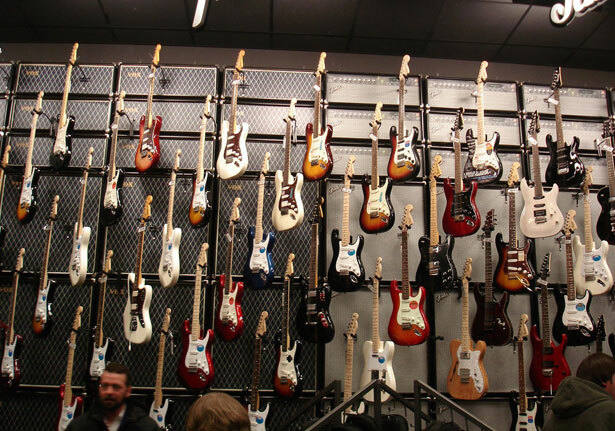 Within the past three years, Guitar Center has rapidly expanded. Four years ago, the chain had 200 stores and it was very rare for the company to open another one. Within the past six months alone, it has opened ten stores. “We’ve seen more stores open, we’ve seen more emphasis on dot com sales, and they were neglecting existing stores and existing markets that were profitable, and the number-one profiting store is Manhattan, and it was falling by the wayside,” Clark says. Guitar Center management was less enthusiastic about the vote. But workers don’t seem to love the working environment at all, which is why they called for the vote. RWDSU started working with workers in late 2012 after workers approached the union complaining of worsening compensation. Workers at Guitar Center make the legal minimum wage plus commission, but they aren’t paid that commission until they sell a certain amount of product against their base pay. “Where that becomes an issue is during slower months, like this month for example, or if a sales person has a bad month, which everyone eventually does. Sometimes you don’t sell enough product and you ultimately don’t make enough money for the company to cover minimum wage, even though you’ve worked full-time and you’ve showed up to work on time and did your job to its fullest, you’re making minimum wage that month,” he says. That’s problematic for a number of reasons. All the money workers make in heavily trafficked months, they hang on to in preparation for months ahead. There’s never a consistent pay check. They’re never fully sure if what they receive in pay is going to cover their bills, because minimum wage in New York City is extremely low. And the problem isn’t just in New York. “It’s a mistake to just focus on Amazon. It’s also Sweetwater, Musician’s Friend, owned by Guitar Center, Direct Factory Sales, and now even Best Buy is selling gear. There is no Internet tax either, so sometimes you have to reduce the price of the product by the tax rate to match your own website. This can often be the entire commission,” the employee added, saying Guitar Center staff are increasingly treated like free consultants. The customers come in, ask about a mixer they bought online, get advice from staff, and then leave. Despite the successful vote at the Manhattan store, it’s difficult to get Guitar Center workers to go on-record about the unionization effort. Clark explained there have been rumors of retribution by management at a Guitar Center in San Francisco where workers voted to unionize. “It didn’t go through successfully for a number of reasons, but a number of sales staff that were vocal during that vote, about five or six months afterwards, they no longer worked there. The company tells us they weren’t fired for supporting the union, but they were fired for other tedious things,” he says. In Manhattan, workers are protected now because they have unionized and they’re in the midst of formulating a contract, so Guitar Center wouldn’t be able to edge out employees without there being some kind of legal repercussions. But before the vote, Clark said people were scared. Clark thought it was worth the risk. “A lot of people have lost sight of the good unions do, mainly building what is now the middle class today,” he says. Clark did everything he was supposed to do. He graduated college even though it buried him debt. He immediately looked for a job, but couldn’t find a high-paying one in the terrible market that is oversaturated with college graduates. “Hard-working, educated people have nothing coming their way because capitalism has driven things into either the high end or the low end. When it all comes down to maximizing profit and the bottom line, there’s no protection for the employee at that point. It’s all focused on the company and how much profit they’re drawing. The less they have to pay someone, the more profit they’re going to make, and the more they can grow their business,” he says. Mass protests are erupting in Brazil. Read Dave Zirin’s analysis here.